You’ll be knocked back by the chaotic activity in its streets, savor local Khmer dishes, marvel at the Royal Palace and Silver Pagoda’s beauty and mourn at the mass graves of countless victims who were savagely murdered by the Khmer Rouge. Phnom Penh offers you a window into one of the darkest periods of modern history, rivaling (if not exceeding) the horrors of the Holocaust. Yet, its booming growth is proof that hope can’t be killed. This is my guide to Phnom Penh in 24 hours. 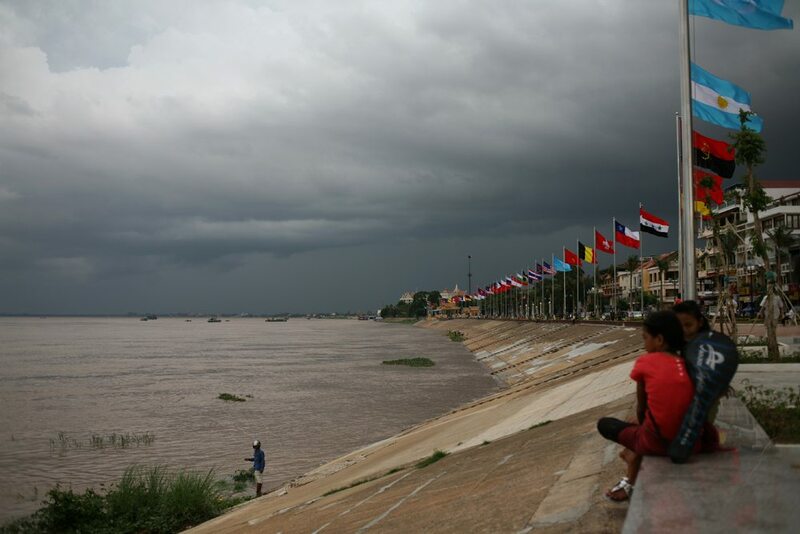 Walk along Sisowath Quay to get great views of the Tonle Sap River. A great place to start your day is with a morning walk along the Sisowath Quay. This is probably one of the nicest pathways available in Phnom Penh. It’s a 3km lane that hugs the dark waters of the Tonle Sap River. Along the way you’ll find terrace cafes, which are a great place to grab breakfast and to enjoy the views. If you’re interested, on the North-End of Sisowath Quay you’ll find a small boat dock where you can take an hour long boat ride along the riverbank. 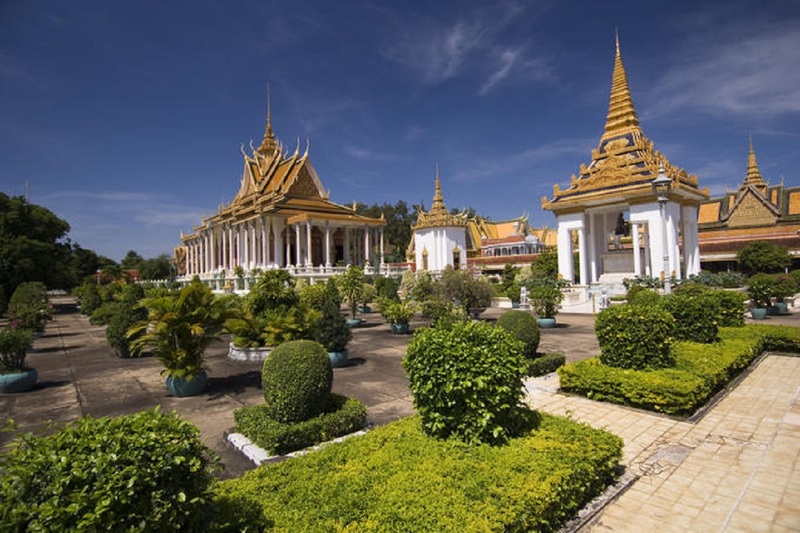 Visit the royal compound to marvel at Royal Palace and Silver Pagoda. Once you’re done walking on the Sisowath Quay, across the street is our next destination, the Royal Palace. This compound is impossible to miss, it’s opulence personified. Walking across the well manicured gardens you’ll come across the Silver Pagoda. This stunning Buddhist temple is bedazzled with thousands of silver tiles and houses several impressive bejeweled statues. Further in you’ll find the Royal Palace, which has been the residence of Cambodia’s kings since 1866. This is an equally stunning building. Close to the Royal Palace is the National Museum of Cambodia. 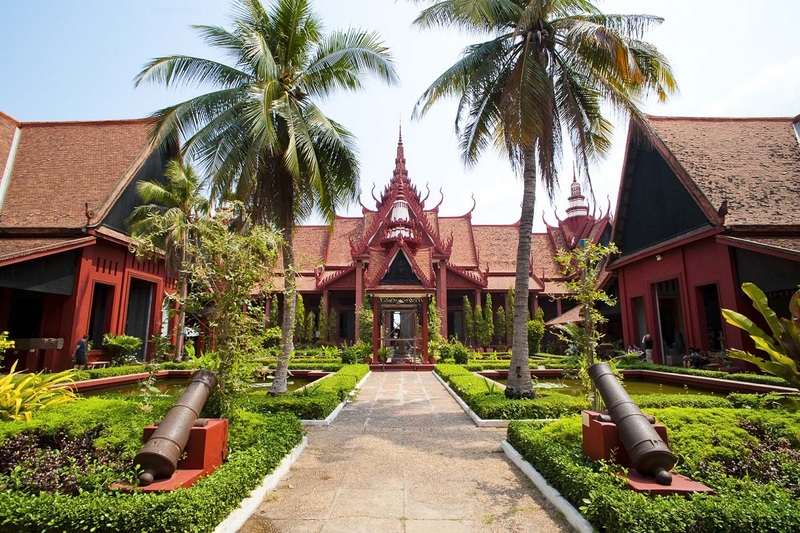 This is the world’s largest collection of Khmer art that includes sculptures, ceramics, bronzes and ethnographic objects. I loved this museum. The historical pieces on display are breathtaking and the museum’s design is unique. It has a beautifully serene terrace area in the middle of the museum (pictured above). Before leaving make sure to purchase tickets from the Cambodian Living Arts Center for their nightly show. Refer “Evening” section (below) for more details. The afternoon will cover much darker territory. You’ll visit the infamous Killing Fields and Tuol Sleng Genocide Museum (commonly referred to as S-21). In case you’re not familiar with Cambodia’s history, in the 70’s Pol Pot and his army came into power and instituted one of the most barbaric regimes the world has ever seen. Pol Pot distrusted the educated and worked very hard on eradicating them. In the end, its estimated that up to 3 million people died under Pol Pot’s rule. What’s truly shocking are the methods of torture and murder that were used. They were primeval and not seen since the crusades. Secure a tuk-tuk for the afternoon and drive from Phnom Penh to these two sites. Start with the Killing Fields. When you get there make sure that you purchase the ticket with the audio guide. It’ll walk you through the grounds, explaining the history and sharing testimonials from survivors. Walking thorough the killing fields is chilling. In the audio guide, you’ll learn that Pol Pot instructed his soldiers not to waste bullets. So victims where hacked to death and had their throats slit by sugar cane branches. Then there’s the “Killing Tree”. Soldiers had a preferred method to dispose of babies. They would grab them by their legs and then savagely slam their heads against the tree trunk. So many babies where killed against this tree that it’s been named the “Killing Tree”. Near the entrance of the Killing Field is a Stupa, it contains the remains of 8985 humans. 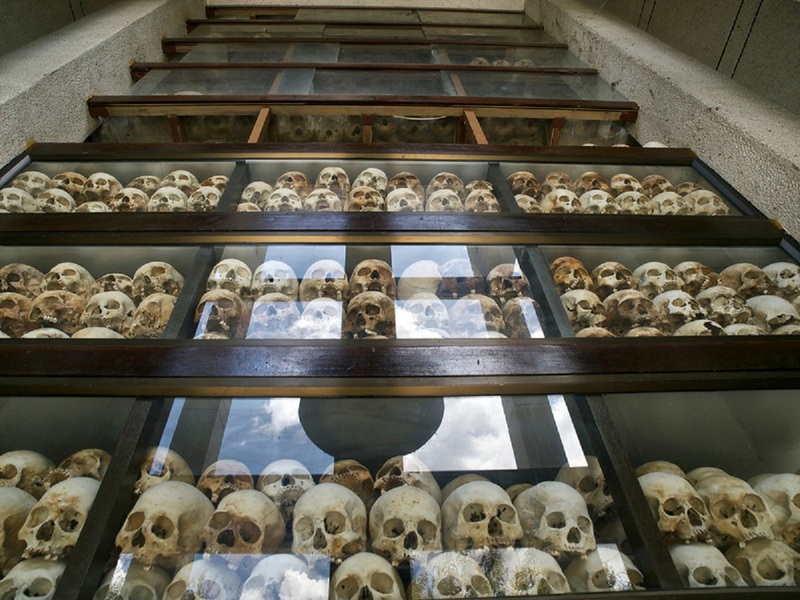 It’s a haunting memorial to the innocent lives that were savagely murdered by the Khmer Rouge. Visiting S-21 will haunt your dreams. 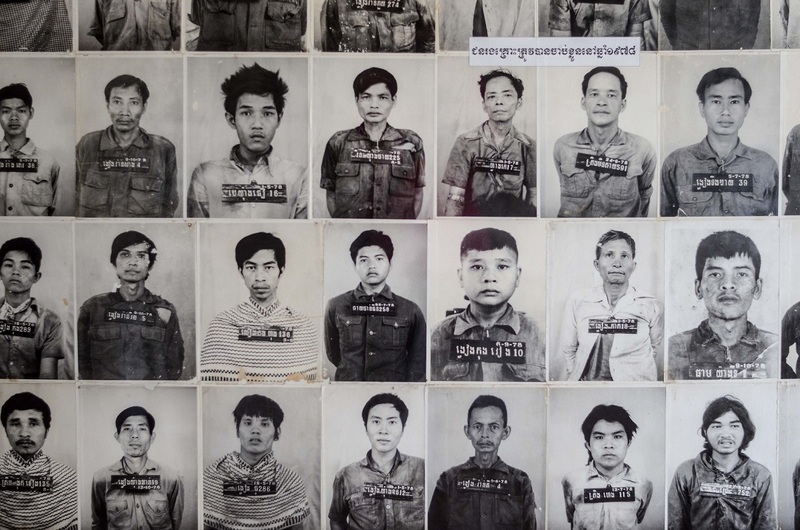 You’ll see photos of victims, their torture and learn about other horrors carried out by the Khmer Rouge. Grab your tuk-tuk and head to S-21. This museum is infinitely more upsetting than the Killing Fields. You’ll get to see photos of the victims, how and where they were tortured. You’ll walk the untouched grounds that retains its dark internment camp qualities. In 1975, Tuol Svay Prey High School was taken over by Pol Pot’s forces. It became an infamous detention and torture center that processed thousands of victims. Just like the Nazis, the Khmer Rouge were meticulous in their record keeping on who passed through the center. This has created a sick archive of black and white images of men, women and children, proof of their existence and death. After the heavy lesson in history, we’ll wrap our day on a more hopeful tone. The Cambodian Living Arts Center hosts nightly Plae Pakaa performances that shouldn’t be missed. This was probably one of the most inspirational stories I came across in Cambodia. Hosted at the National Museum of Cambodia, this troupe performs traditional Cambodian dances. Before starting their performances, they give an introduction on how they started. They explain, as a result of the Khmer Rouge, this piece of Cambodian culture was almost lost. They had to go looking for the last remaining dancers that still remembered this folk art, to pass it along to next generation. The story’s very powerful and moving. The performances where exquisite and engrossing. To end our day in Phnom Penh I recommend you eat at Friends. You can make it either an early or late dinner (before or after the show). Friends is part of an NGO organization that employs at-risk and street youth in the restaurant. They train these teens for a year in the restaurant business, then works on placing them in jobs once their training is up. The food served at this restaurant is top notch.